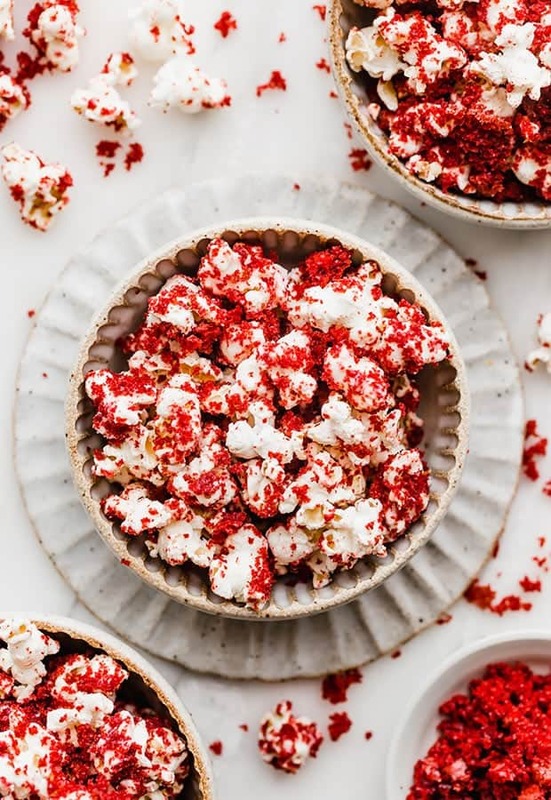 This Red Velvet Popcorn is made by drizzling white chocolate over fluffy popcorn then tossed in red velvet cake crumbs! I added cake to my popcorn. This shouldn’t come as a big surprise to you, considering I added bacon to my popcorn. Yes, bacon popcorn. It’s totally a thing. And so is cake popcorn, or should I say, RED VELVET cake popcorn! ?? For some reason red velvet is the unofficial cake/dessert for Valentines Day. So if you’re looking for a Valentines Day snack you can make with kids this is the perfect treat to make! First, we need to bake a red velvet cake. Using a box cake mix simplifies things, so that’s what I did. However, there are loads of red velvet cake recipes on the internet. So if you want to make one from scratch, go right ahead! 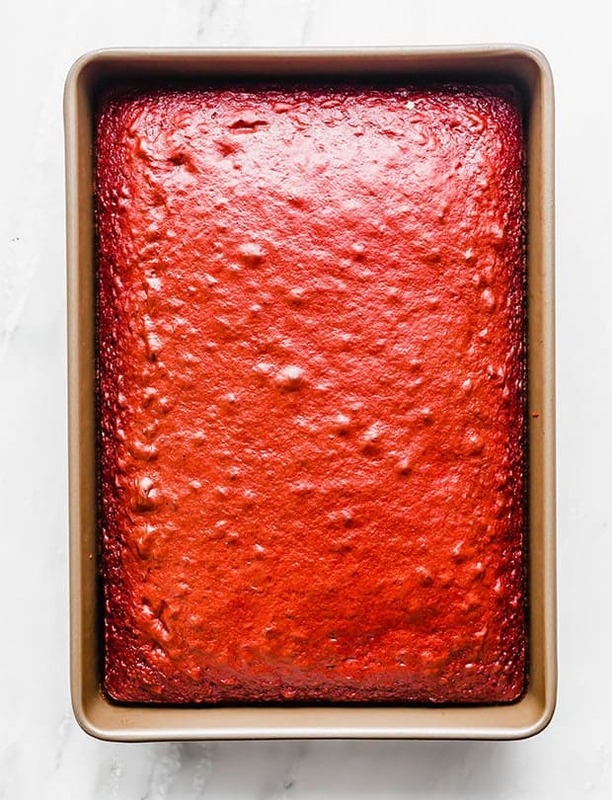 I baked the red velvet cake in a 9″x13″ inch pan. Once you bake the cake, let it cool. Then proceed by crumbling 1/3 of the cake. You need a total of 4 cups of cake crumbs. To crumble the cake, I simply dug into the cake and starting breaking the cake into small pieces. It was a lot of fun! If you have children or grandchildren, get them involved in this step! Once you’ve crumbled the cake it’s time to pop some popcorn. I used my air popper for this. Place the freshly popped popcorn on a wax paper lined baking sheet OR place it in a large bowl. You’ll see why in just a moment. Next, it’s time to melt the white chocolate chips. 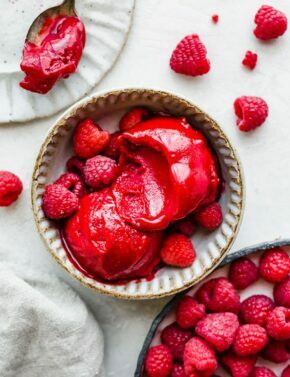 Do this in the microwave at half power, stirring every 30 seconds or use a double boiler. Once the white chocolate is fully melted pour it over the popcorn. 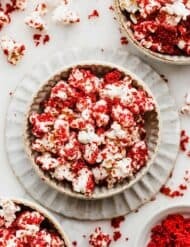 After I made this Red Velvet popcorn recipe, I realized it may have been easier to place the popcorn in a large bowl rather than on a baking sheet, and drizzle the white chocolate over top of the popcorn. Either way, you need to drizzle the chocolate over the popcorn. 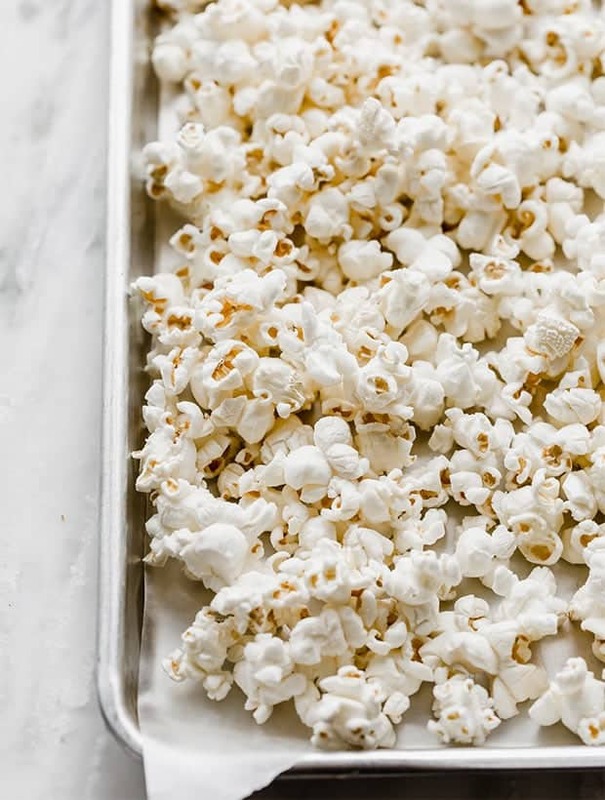 Once you’ve successfully done that and you’ve tossed everything so that all of the popcorn is coated, transfer the popcorn to the wax paper lined baking sheet (if you tossed the popcorn in the bowl) and place the cake crumbs overtop of the white chocolate covered popcorn. 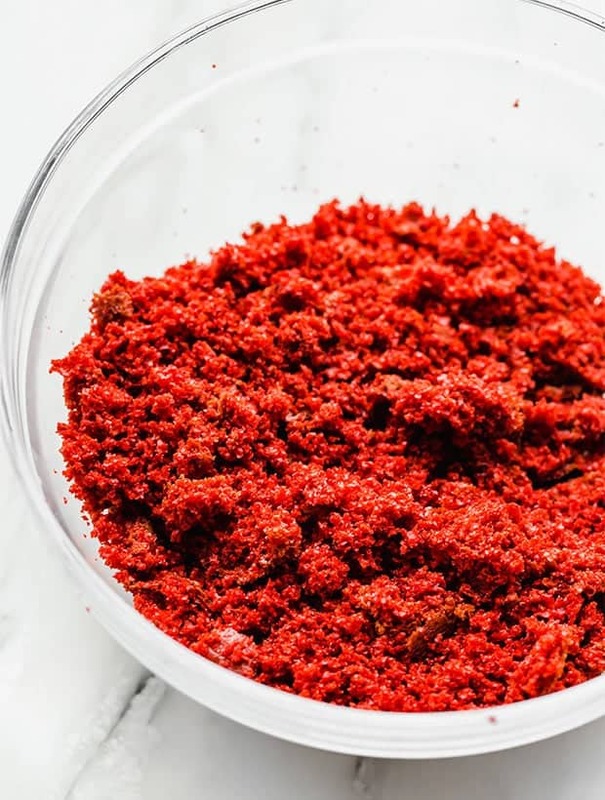 Gently toss the popcorn so that the red velvet cake crumbs are covering the popcorn. Let the popcorn set for 10-15 minutes and then serve! 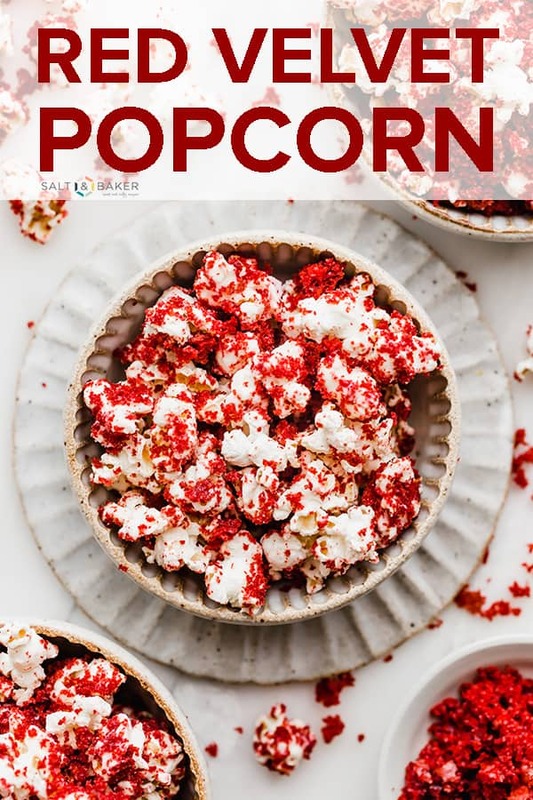 Fluffy popcorn topped with melted white chocolate and covered in crumbled red velvet cake crumbs. Once the cake has been baked, remove it from the oven and let it cool. Once cool, crumble about 1/3 of the cake into small pieces. You’ll need 4 cups of crumbled cake. 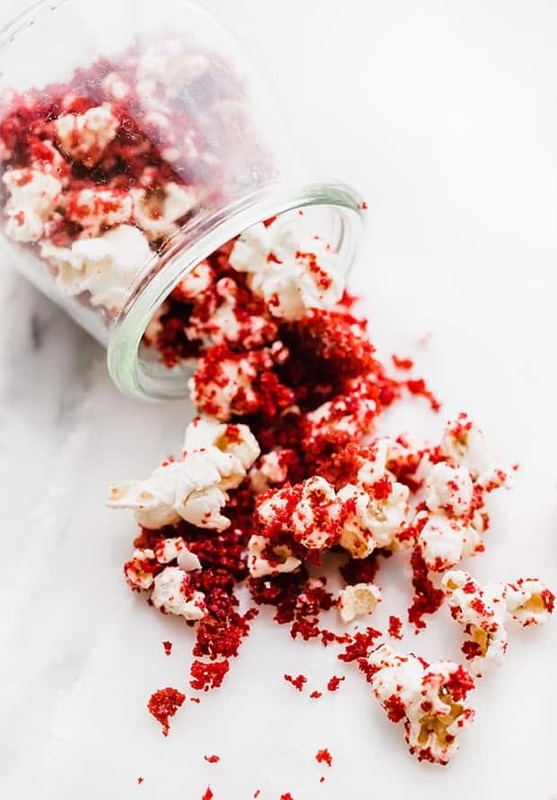 Immediately sprinkle the red velvet cake crumbs over the white chocolate covered popcorn. Gently toss until the popcorn is evenly coated with the cake crumbs. Let the chocolate set. Serve! * You can also melt the chocolate over a double boiler if you'd prefer. **OR you can place the popcorn in a large bowl and drizzle the white chocolate over the popcorn. Toss to coat. 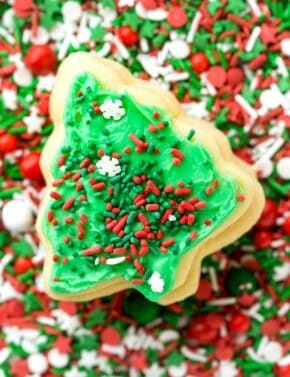 THEN spread the white chocolate covered popcorn on the wax paper lined baking sheet and sprinkle the cake crumbs overtop. This is so creative, Whitney! I want to make popcorn with cake crumbled on top now 😉 I’m not a big fan of red velvet, but my husband is! He’d love this. Thanks Madison!! It turned out really yummy! 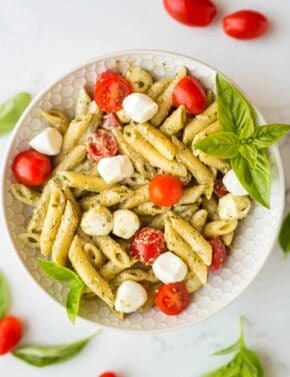 Let me know if you ever try the recipe.